Fresh Tomato and Summer Herb Soup, Thyme for Cooking easy recipes. 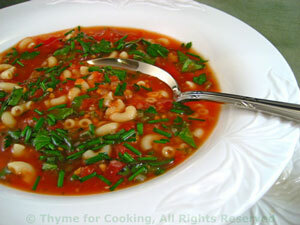 With the abundance of herbs and tomatoes right now this is a perfect soup. It's a fresh, light and lovely first course. Serve warm or room temperature. Sauté shallots and garlic in medium saucepan in olive oil over medium heat until soft and transparent, 7 - 10 minutes. Add tomatoes, chicken stock, and pasta, cover and simmer over low heat for about 15 minutes, stirring every few of minutes so pasta doesn't stick.